New year: New launch. And, to give IPC their dues, they were really pushing the boat out to make sure new additions to the line had the best possible chance of success amongst their existing readership. 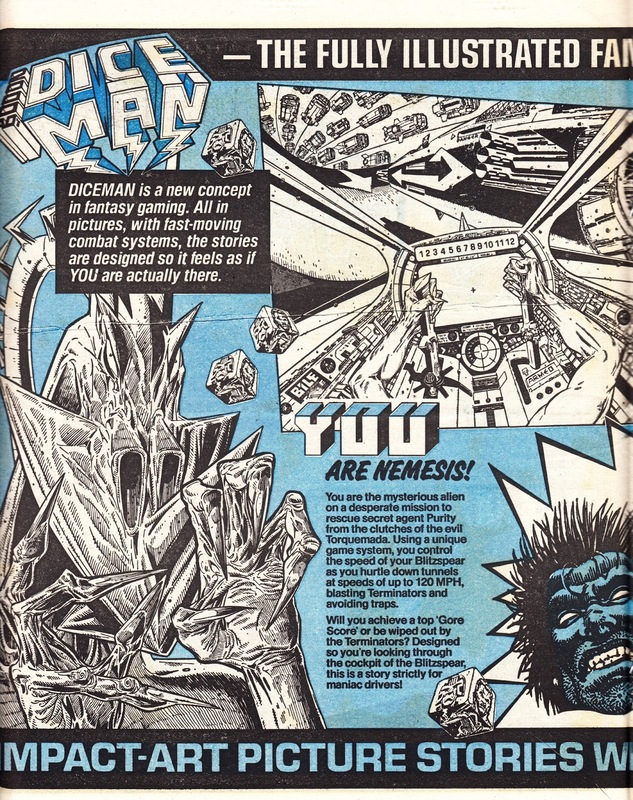 2000AD's DICEMAN was an innovative attempt to capitalise on the success of Fighting Fantasy stylee Choose-Your-Own-Adventure fare and Role Playing Games by transferring the format to comic strips. 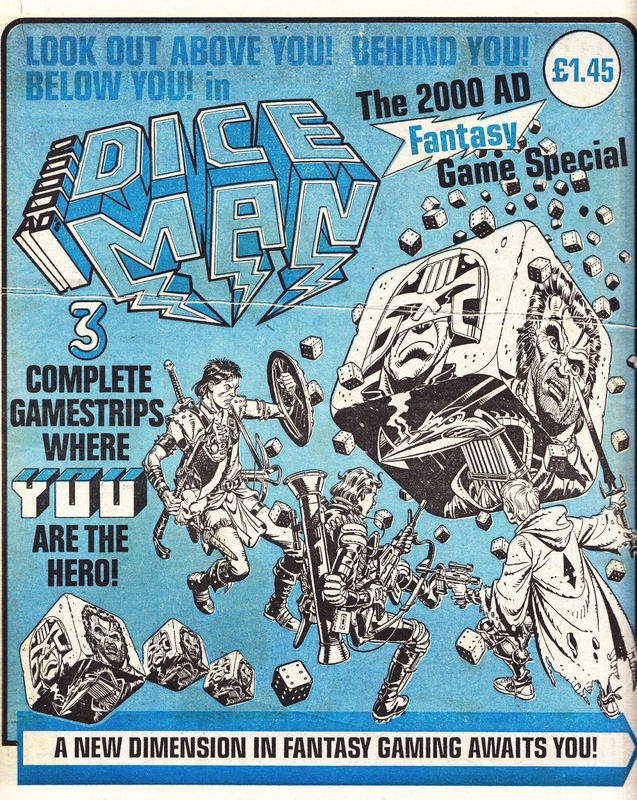 It was a nice idea and nicely executed, although some of the pencil-paper-dice shenanigans were probably overly complicated for thrill seekers who just wanted something to read on the loo. 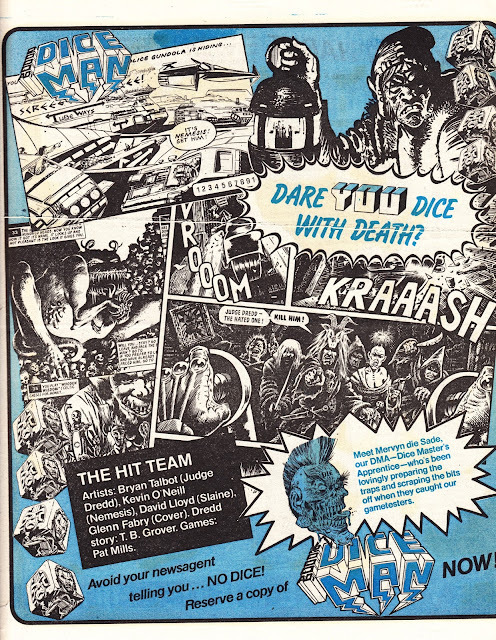 This four-page centre-spread advert, published in IPC's weeklies dated 25 January 1986, billed it as a "fantasy game special" but the magazine was actually ongoing, albeit dependent on the sales of the last issue before the next would formally be announced. Five issues appeared, roughly bi-monthly, between January and October before the idea was quietly dropped. The titular Diceman, created by Pat Mills, didn't surface until the second issue. 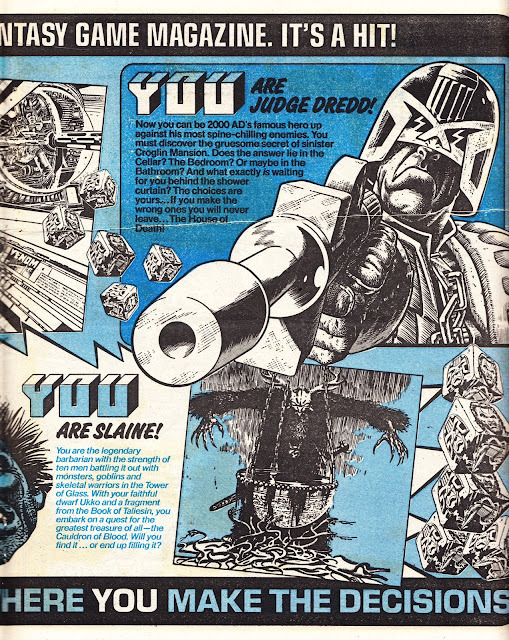 Other featured characters throughout the run included Judge Dredd, Rogue Trooper, Slaine, the A.B.C Warriors, Torquemada (of Nemesis fame) and - errr - President Reagan. What killed Diceman? Possibly the concept - and its fan base - wasn't sustainable. The erratic publication schedule almost certainly didn't help build much loyalty with readers or the news trade. But I think it was the cover price that killed it. £1.45 was a hefty bit of coinage compared with 24p for an IPC weekly or 30p for a (full colour) Marvel UK comic. OK, the format was much slicker (glossy paper throughout, albeit with b&w interiors), it boasted an increased page count and it took longer to read (and - no doubt - longer to plan and produce) but it cost more than a Summer special. I remember getting a copy of the first issue but I didn't make it a regular buy because - even if I could find it - it wasn't impulse-purchase friendly.